Description: Students will be divided into 5 teams with the first person from each team standing inside a starting hoop with a pair of chopsticks in their hand. On the signal to begin, these players must power walk to the pile of “Who’s” in the hula-hoop. K, 1st and 2nd graders can use both hands with the chopsticks to pick up a Who and power walk back to the beginning hoop. 3rd, 4th, and 5th graders may only use one hand with the chopsticks (they have to put the other hand behind their back) to pick up a Who and power walk back the beginning hoop. Students from all grades then place the Who in the bucket and pass the chopstick to the next person in line. Teams will continue to go until time has been called. 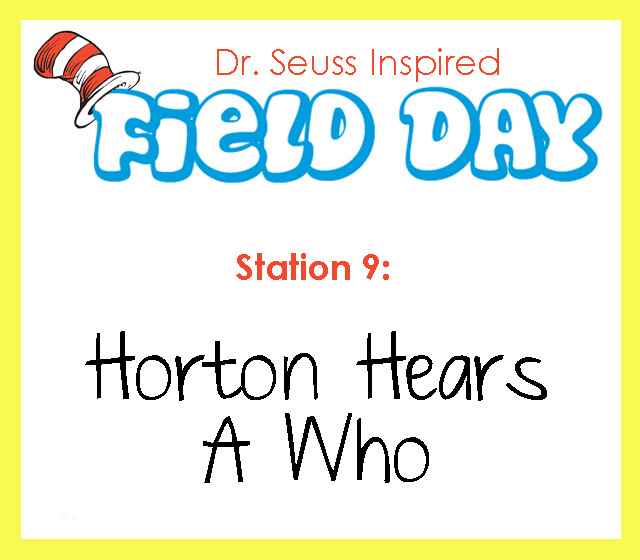 This entry was posted in End of the Year, Games, PE & Health and tagged Children, Dr. Seuss, Education, Elementary School, field day, Games, Homeschool, Kids, outside games, Teacher Resources, Teachers, Teaching by Squarehead Teachers. Bookmark the permalink. What did you use for the Who’s? I love all these ideas. Thanks for sharing. You can use whatever small, relatively light weight object your school has. Bean bags, or those yarn puff-ball pom-pom things are common items a school might have. Usually something not smooth on the outside is easier for kids.